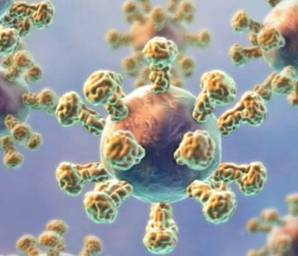 Immunocastration is a vaccination that stimulates the immune system to produce specific antibodies against endogenous GnRH. Proteins with 10 amino acids vs. 9 amino acids, both too small to have antigenic effect. Source: Improvac. Analogue GnRH conjugated to a carrier protein. Source: Improvac. 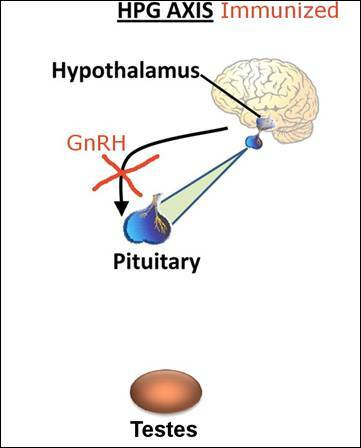 Natural GnRH will bind to pituitary receptors and stimulate LH- and FSH-release. Source: Improvac. 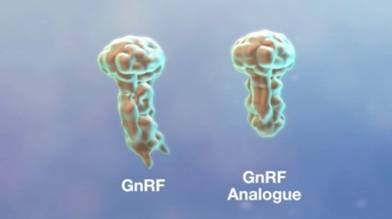 The injection of a modified form of GnRH conjugated to protein (Improvac(r), Pfizer Ltd) induces the formation of antibodies against GnRH, which binds to endogenous GnRF and blocks the release of LH and FSH hormones. This analogue of GnRH has no hormonal activity. Neutralized natural GnRH cannot bind to pituitary receptors and will therefore lose its hormone releasing activity. Source: Improvac. The prevention of LH and FSH secretion reduces the secretion of androgens and as a result the testis size decreases twice or threefold compared to that of an unvaccinated boar. The reduced levels of testicular steroids also accelerate metabolic clearance and reduce the skatole levels in vaccinated pigs (Zamaratskaia, 2010).